Song is series of rolling musical “churry churry churry” notes; similar to Carolina Wren. Description: Short-tailed and long-legged. 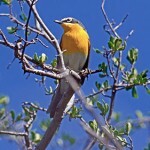 Bright olive upperparts; completely bright yellow underparts; bold yellow spectacles separate black crown from black on face and sides of neck. 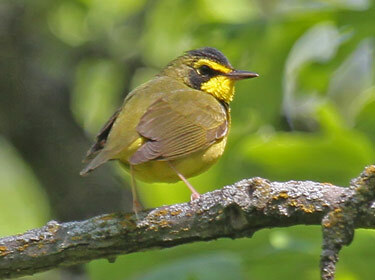 Black areas are duller on female. Behavior: Nests and feeds on the ground in dense undergrowth. 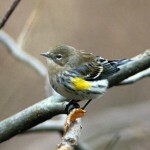 Habitat: Found in rich, moist woodlands, ravines, and bottomlands. 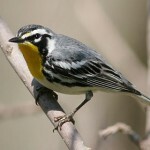 Where in Nebraska: Rare to uncommon spring and fall migrant in southeastern Nebraska, and summer resident in lower part of Missouri Valley, north to Sarpy County. Fun Facts: They prefer dense understory woodlands for habitat, but increasing numbers of foraging deer are decreasing their available habitat.